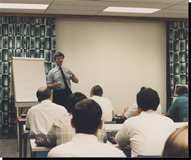 Dr. Salmon's philosophy on training dates back to his days on the shop floor, as an apprentice at Rolls-Royce, in England. Having spent his formative years in both a production and academic environemnt, he saw the need to merge the intuitive, shop-floor approach to getting things done, with the theoretical, yet scientifically proven methods determined through academic research. He felt that it was important to make the new theories understandable and take them to where they could usefully be employed - on the manufacturing floor. So, with articles in the industrial press and "hands-on" seminars spanning more than 20 years, Dr. Salmon has succeeded in breathing new life into the precision grinding and abrasive machining industry. With his innovative technology, his passion and enthusiasm for manufacturing, Dr. Salmon is an internationally recognized and sought-after speaker. He has written and contributed to numerous books, technical papers and magazine articles. He teaches not only the general principles of grinding, but also customizes training and educational seminars to the needs of the industrial audience or an individual company client.